The Pantech Maruader first leaked last week as the Star Q, but the specs that accompanied the leak were all sorts of wrong. The device actually has a 1.2GHz dual-core Snapdragon processor, likely the same chipset that is in the Incredible 4G LTE. It also has a 5MP camera, 1GB of RAM, and will be available for $49 on August 2 after a $50 rebate. Verizon is directing this device at first time smartphone owners, or those that are coming over from having feature phones for years. The UI looks super simple, almost feature phone-esque, but the price is the key here. Not a bad option for those making their first smartphone purchase that aren’t planning on using much data with Share Everything. Then again, the Galaxy Nexus can be had for $50 more and is 10x the phone. BASKING RIDGE, NJ and HAUPPAUGE, NY — Verizon Wireless and Pantech today announced the 4G LTE-powered Pantech Marauder™ is coming exclusively to America’s largest 4G LTE network starting Aug. 2. The Pantech Marauder provides first-time smartphone customers with a dual-interface option, allowing customers to fit the device to their lifestyles or specific needs. Brought to market by Personal Communications Devices, LLC (PCD), the Pantech Marauder offers customers the option to choose between Starter Mode and Standard Mode. Starter Mode is a simplified and more intuitive experience that is perfect for those who are new to the smartphone world. This option eases first-time customers into the smartphone experience with the help of four easy-to-learn home screens featuring preset widgets and an uncluttered, easy-to-use lock screen. Starter Mode also features a quick dialer icon that allows customers to make phone calls directly from the home screen. Standard Mode is a general smartphone setting for those who are familiar with the Android™ experience. It offers up to seven fully customizable home screens and a customizable lock screen with quick access to frequently used applications. All settings are maintained when switching between modes so customers do not have to worry about losing information. The Pantech Marauder features a virtual keyboard as well as a slide-out QWERTY keyboard, making it the perfect choice for messaging aficionados and for those who want an excellent messaging experience. With the 5-megapixel camera, customers can take pictures, capture high-definition video, and easily share them as well as video chat with family and friends, using the Verizon Wireless 4G LTE network. The Pantech Marauder will be available online at www.verizonwireless.com starting Aug. 2 for $49.99 after a $50 mail-in rebate with a new two-year customer agreement. Customers receive the rebate in the form of a debit card; upon receipt, customers may use the card as cash anywhere debit cards are accepted. 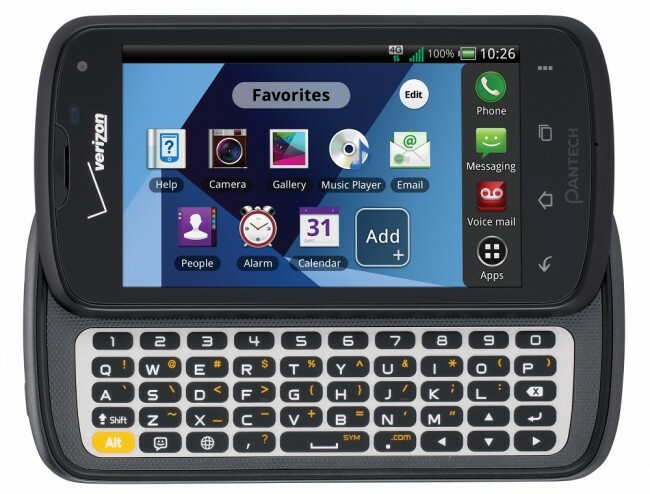 New customers that purchase a Pantech Marauder smartphone will need to subscribe to a Verizon Wireless Share Everything plan. Customers can purchase unlimited talk and text messaging with 1 GB of data for $90 monthly access. Customers can visitwww.verizonwireless.com/shareeverything for additional information on data plans. Pantech Co., Ltd., is one of Korea’s top three mobile handset makers. Pantech has received wide-ranging industry recognition for its innovative handset designs, and has also introduced a significant number of breakthrough technologies in the mobile phone industry. Established in 1991, Pantech collectively has approximately 3,000 employees and 4 regional sales offices worldwide. For more information on Pantech, please visit www.pantechusa.com.